There are few things more luxurious than a really nice glass of champagne with a delicious chocolate truffle which is great but how in the world do you translate that sensation of indulgent luxury into an ice ream already deeply luxurious? 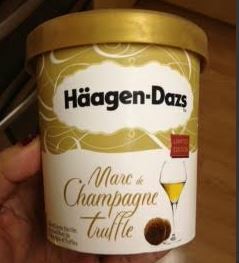 Enter the decadent Marc de Champagne ice cream from Haagen-Dazs. 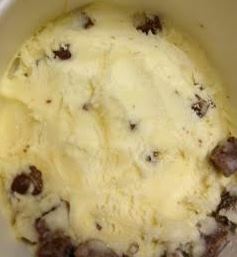 This ice cream combines that marc de champagne flavour in the ice cream with the chunks of chocolate for that indulgent truffle accompaniment. The ice cream I have to admit is very different from what I expected but it is brilliantly executed. There is a real grapey flavour coming through from the marc de champagne but without a super boozy taste. The chocolate chunks taste interesting if slightly darker than I had expected. The ribbon of marc de champagne through the vanilla ice cream really comes through strongly and makes this ice cream absolutely different and quite unique. The chocolate truffle pieces are a bit hard as they are frozen but they are plentiful.